Popular author with books on Kabbalah, meditation and Jewish theology. Rabbi Aryeh Kaplan was a Jewish author, writing over 50 books, some of them related to Kabbalah and Jewish Meditation. He passed away suddenly at the relatively young age of 48, leaving a wife and nine children. His books have brought many unaffiliated Jews closer to Judaism and spirituality. At the same time also serving as a springboard for members of the Yeshivish community into a new path of Kabbalah, Breslov and Chasidus. Born to Shmuel and Feiga Kapplan in 1934. 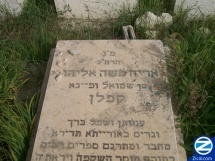 Rabbi Aryeh Kaplan is buried in Har Hazaysim. The yortzite of Rabbi Aryeh Kaplan is on the 14th of Shevat. Some of his students have a custom of visiting his kever on his yortzite.